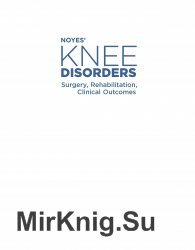 Frank R. Noyes, MD internationally-renowned knee surgeon and orthopaedic sports medicine specialist presents this unparalleled resource on the diagnosis, management, and outcomes analysis for the full range of complex knee disorders. Relies on Dr. Noyes meticulous clinical studies and outcomes data from peer-reviewed publications as a scientifically valid foundation for patient care. Features detailed post-operative rehabilitation programs and protocols so that you can apply proven techniques and ease your patients progression from one phase to the next. Presents step-by-step descriptions on soft tissue knee repair and reconstruction for anterior cruciate ligament reconstruction, meniscus repair, soft tissue transplants, osseous malalignments, articular cartilage restoration, posterior cruciate ligament reconstruction, and more to provide you with guidance for the management of any patient. Contains today s most comprehensive and advanced coverage of ACL,PCL, posterolateral, unicompartmental knee replacement, return to sports after injury, along with 1500 new study references supporting treatment recommendations. Features all-new content on unicompartmental and patellofemoral knee replacement, updated operative procedures for posterior cruciate ligament and posterolateral ligament deficiency, updated postoperative rehabilitation protocols, and new information on cartilage restoration procedures and meniscus transplantation. Includes some of the most comprehensive and advanced discussions on arthrofibrosis, complex regional pain syndrome, tibial and femoral osteotomies, and posterolateral reconstructions available in modern published literature. Covers gender disparities in ligament injuries for more effective analysis and management.